I had quite a busy business trip so a bit of a break in posting. Anyway, here is some casual wear from today. A look that's actually quite close to what I like wearing during casual winter days when it gets cold. 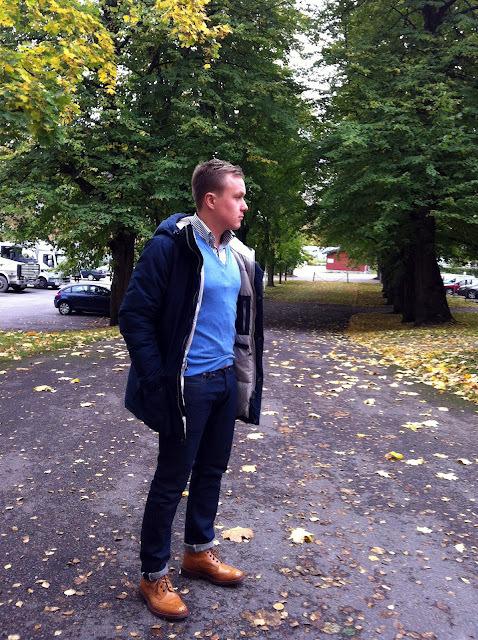 A simple navy parka good for winter, raw denim and brogue boots. 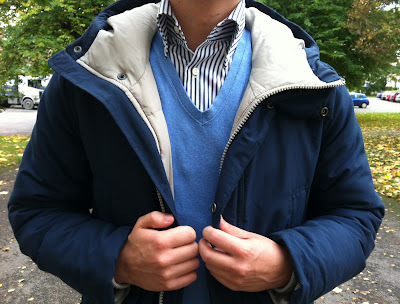 The vest is wool cashmere and about the right warmth for fall. Later in the year I'd probably go with a heavier knit. Too bad I didn't have a better camera than an iPhone to take this picture, as I just love the texture of these jeans. Raw denim with a white cotton woven in it, it is just fantastic. 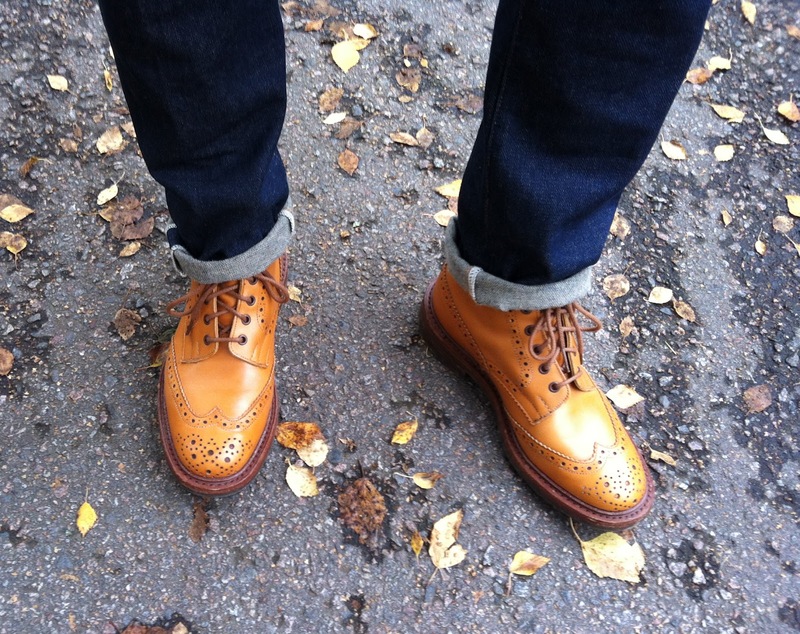 Love how it goes with my Tricker's boots as well, which are my most comfortable pair of shoes. Just discovered your blog, I really like your style, and particularly enjoy ed reading the thoughts behind your choices. I'm thinking about getting a Gloverall mid-length duffle coat, and I'd like to hear your opinion about it (if you have any!). Thanks! About the duffle coat, I cannot see them really in my own wardrobe, but if you like the coat I don't think Gloverall will be a bad choice. Made in England and I've read good things about the fabrics, so go for it. I'm a big fan of those boots and jeans. Who makes them? 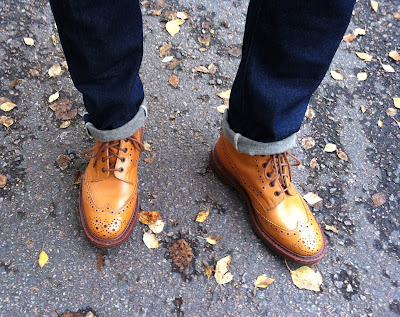 Jeans from Indigofera and the boots are from Tricker's. "Too bad I didn't have a better camera than an iPhone to take this picture"
You should think about buying Nokia Lumia 920 ;) What is the brand of those jeans? Very nice deep indigo color - I like. Heh, I've been thinking about it, but what the Nokia gains in the camera and the UI it lacks twice more in apps. Still, I might go that way. Or just get a camera.